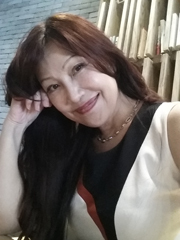 Jasmine has worked as a Kansai District Coordinator of the Japanese Representative Office for Pennsylvania State Ministry of Regional Restoration & Economic Development and as an International Trade Supporter of Malaysian State Government Office. She is a supporting member of Thai/Bangkok Culture and Economic Information Group and frequently visits the country. She has been actively involved in exhibiting Egyptian therapy in Japan through an exclusive contract with the supplier.Also Jasmin introduce many kind of therapy from all over the world. Jasmine is currently a representative of International Kobe Mental Beauty Academy. – Malaysian Therapy (Initiation by the Dunsun tribe of Malaysia) . Sharmanizum -Reiki. Kikoul Energy-work. – Certificate for Drug Abuse Prevention Adviser by Lions Club.